Weather is taking a new turn with constant snowfall in lower Himalayas. February that started on a warm note is clouded with stratus clouds signalling more snow in the mountains. Though days are warmer than January, mornings and evenings remain chilly with cold winds. These are indications of another cold wave before winter bids adieu. School recorded maximum temperature at 26°C and minimum temperature at 11°C. Humidity was at 24%. Wind blew at 8 km/hr. Sportsman’s spirit is taking part in sports and playing the game by the rules. It is also playing the game with your heart and soul, with joy and liveliness. Sportsman ship is an aspiration that a sport or activity will be enjoyed for its own sake, with fairness, respect and a sense of fellowship with one’s competitors. A true sports person has to be a good winner and a good loser. It means that when you lose, you take it in your stride and try to analyze your mistakes and if you win then you will not be over-confident and gloat over your opponents. A good sports person is ready to accept any situation that comes up in the course of the game. He is always there for the team. A sports person has to accept any role that his skipper assigns for him. Winning and losing is a part of the game and the match always goes to the player who is better prepared for it on that day. Shaking hands with your opponents is considered the right spirit of a good sportsman. Enjoy the game and maintain the team spirit in the game. 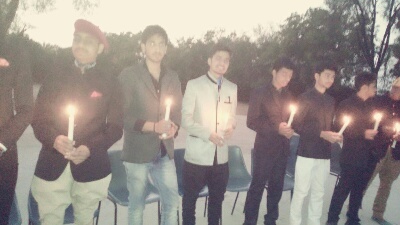 Saturday, 13th February: On Saturday evening the School bid Farewell to Class XII. 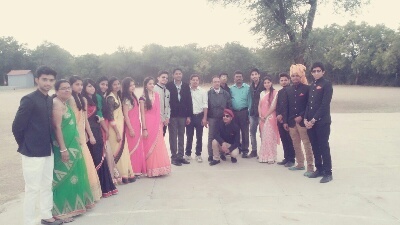 Class XI organized the show. Class XII and the staff were invited for the farewell party. 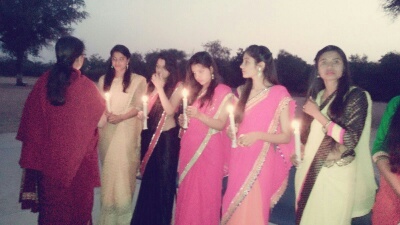 In a heart-warming the farewell party started with Principal lighting of the candles of the outgoing students. She passed by each student lighting their candle with a personal message and advise to each student; signifying good wishes and light of knowledge in their world, students, with lit candles in their hands touched the feet of all teachers flanked on the opposite side on the Basketball court, seeking their blessings for a bright future. Amidst dance, song, compliments and poems, students and teachers narrated their moments with the school and learning lesson while in School. The students were presented with mementoes as a mark of blessing and remembrance. Thursday, 11th February: Students were seen preparing for the Sports Day. Sports teachers are working hard to make the Sports Day a grand celebration. Students and Sports teachers were seen preparing the ground and tracks for the grand celebration on 12th and 13th February. Friday, 12th February-Saturday, 13th February: School celebrated its 8th Annual Sports Meet on both the days. In a solemn opening ceremony Principal, ICON School, Bhopal Mr. Neeraj Bhargava unfurled the School flag; the whole school sang the School song; March pasted; the Chief Guest lighted the Sports Torch that was in Sports Captain Khushagra Singh’s/ XII S hands. In turn Kushagra ran with it on the track while each House Captain took the torch and completed the auspicious round to start the Sports Day. The Sports Captain administered the solemn oath to the House with the four houses taking the oath with him. Students presented Surya Namaskar followed by Yoga Display and Aerobics. Various field and track events put the students in high spirit, each house members cheered for their house representatives. Friday, 12th February: Field events of Pre- Primary, Junior and Senior Section were held. They participated in ball picking, back throw, hop race, shuttle run, back race, high jump, long jump, shot put, etc. On 13th February track events like 100M, 200 M, 400 M, 100* 4 Relay and 200* 4 Relay races of both Senior Boys and Girls took place. Thanks to all those parents who came to witness the events. Along with Chief Guest Principal Mr. Neeraj Panwar, School has started with a new culture of honouring parents to give away prizes for certain events. Thanks to Mrs. Ramila Tripash, Mrs Krishnapal Kunwar, Mrs.Praveen Imran Khan, Mr. Vikram Singh, Mr. Ramesh Choudhary and Mr. Mahendra Kumawat for giving away the medals and certificates to our winners. Sports Meet ended with Vote of Thanks by the Head Girl Vaishali Rao/ XII C followed by the declaration of Chief Guest to close Annual Sports Meet. It was a great day for all. Tuesday, 9th February- Thursday, 11th February School celebrated its Social Science Week. A number of activities were carried out both in the Assembly and classes. Students gave speeches on famous personalities; information about civilizations, wars and interesting facts. Many congratulations to Mr. Kailash Kumar Dangi on the birth of his new born son on 2nd February. Our heartfelt condolences to the School gardener Tejaram who lost his mother on 3rd February in Goa. The School prays for strength for the family and peace for the departed soul. Tuesday, 9th February: During PDP session faculty sat in groups and discussed on the proposed story of ‘The Hare and Tortoise’ that how can we help the hare and tortoise to walk hand in hand and relate it with classroom situations. All the groups had a good discussion and shared their views in session. Thank you Mr. Neeraj Bhargava, Principal ICON School, Bhopal for gifting School a whole lot of story books, encyclopaedias and dictionary for Pre Primary and Primary.